In 2016, Danny “Woody” Woodward and Stewart Williamson combined their names and their talents to form Wild Wood Jewelry, a joint venture to create and handcraft unique and beautiful rings and other works of wearable art. 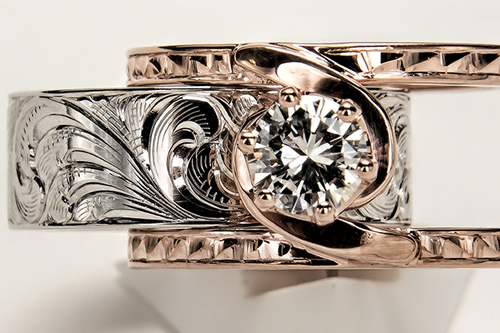 This partnership fuses the skills and passions of two native New Mexicans and lifelong friends – one a second-generation custom jeweler, and the other an award-winning engraver. Woody’s parents opened Woody’s Jewelry in Portales, New Mexico, in 1955, and the young man who shared his father’s nickname grew up working in the family business on Portales’ downtown square. A few dozen miles down the road, Williamson was raised on a ranch homesteaded by his grandparents in 1915. Woody graduated from the Gemological Institute of America course in 1983, has been a Jewelers of America certified bench jeweler since 1999, and is the only member of the Retail Jewelers Organization in a 100-mile radius. For decades, his jewelry creations have been customer pleasers in an extensive geographic area. Stewart, meanwhile, has enjoyed a successful career designing, building, and engraving spurs, bits, buckles, and more with a steady hand that earned him the Engraver of the Year Award in 2010 from the Academy of Western Artists, and the 2013 Adolph Bayers Spur Maker of the Year Award from the National Bit, Spur, and Saddle Collectors Association (NBSSCA). The two first collaborated on a pair of diamond-encrusted bootleg spurs that won the Best of Show award at the NBSSCA’s Mark of the Makers Contest in 2014 in Denver, and topped the spur category at the Pendleton Cattle Barons Show in 2016. As Wild Wood Jewelry, Woody and Stewart are partnering to build striking hand-engraved rings and other keepsakes born from gold, platinum, silver, diamonds, and turquoise. Whether you choose a completed piece from their ever-changing inventory, or opt to work directly with Woody and Stewart to design a one-of-a-kind masterpiece, your Wild Wood jewelry is destined to become a treasured heirloom. Here are some examples of the strking designs we create. We carry all shapes and sizes of diamonds, precious colored stones, and semi precious stones. We can also incorporate a family heirloom stone and custom create other wearable art and keepsake items. 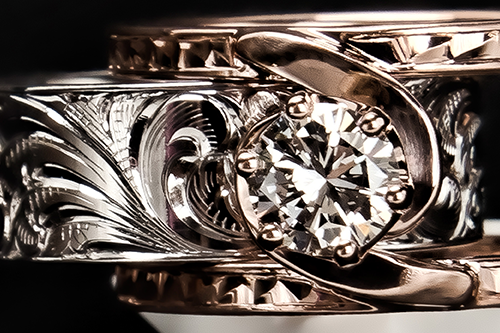 White and rose gold hand engraved set with 3/4ct round brilliant cut diamond. The ring is made so that you can wear the band by itself or insert it into the guard with diamond. 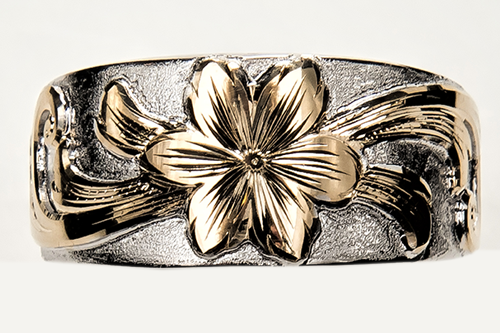 The yellow gold is an 8mm hand engraved tapered band that can be worn alone or with the .25cttw halo guard. 10mm tapered hand engraved band with .61ct round brilliant cut diamond. Shown with two diamond bands. 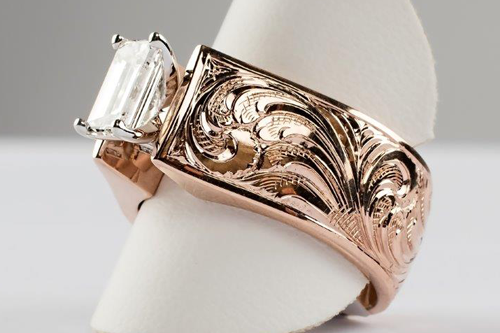 10mm tapered 14kt rose gold cathedral style hand engraved ring set with 1.08 emerald cut diamond. 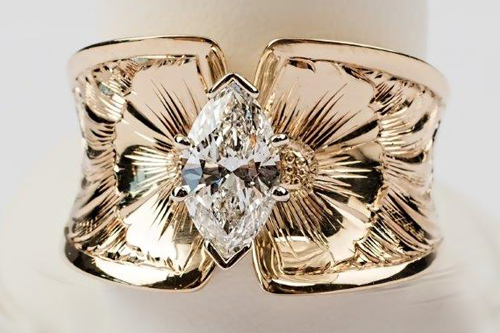 The yellow gold is a 12mm wide hand engraved tapered band that can be worn alone or with the .73cttw diamond fashion ring from S Kashi of New York. 14kt white gold diamond and turquoise ring using client’s gold and diamonds. Choose a completed piece from our ever-changing inventory, or opt to work directly with us for your own unique design. Either is destined to become a treasured heirloom. Danny and Stewart first collaborated on a pair of diamond-encrusted bootleg spurs that won Best of Show award at NBSSCA's Mark of the Makers Contest, 2014 in Denver. We look forward to hearing from you. When you contact us you will be in touch with one of the artists and not a sales person.